Spark is shaping up as the leading alternative to Map/Reduce for several reasons including the wide adoption by the different Hadoop distributions, combining both batch and streaming on a single platform and a growing library of machine-learning integration (both in terms of included algorithms and the integration with machine learning languages namely R and Python). At AppsFlyer, we’ve been using Spark for a while now as the main framework for ETL (Extract, Transform & Load) and analytics. A recent example is the new version of our retention report that we recently released, which utilized Spark to crunch several data streams (> 1TB a day) with ETL (mainly data cleansing) and analytics (a stepping stone towards full click-fraud detection) to produce the report. One of the main changes we introduced in this report is the move from building on Sequence files to using Parquet files. Parquet is a columnar data format, which is probably the best option today for storing long term big data for analytics purposes (unless you are heavily invested in Hive, where Orc is the more suitable format). The advantages of Parquet vs. Sequence files are performance and compression without losing the benefit of wide support by big-data tools (Spark, Hive, Drill, Tajo, Presto etc.). One relatively unique aspect of our infrastructure for big data is that we do not use Hadoop (perhaps that’s a topic for a separate post). We are using Mesos as a resource manager instead of YARN and we use Amazon S3 instead of HDFS as a distributed storage solution. HDFS has several advantages over S3, however, the cost/benefit for running long running HDFS clusters on AWS vs. using S3 are overwhelming in favor of S3. That said, the combination of Spark, Parquet and S3 posed several challenges for us and this post will list the major ones and the solutions we came up with to cope with them. 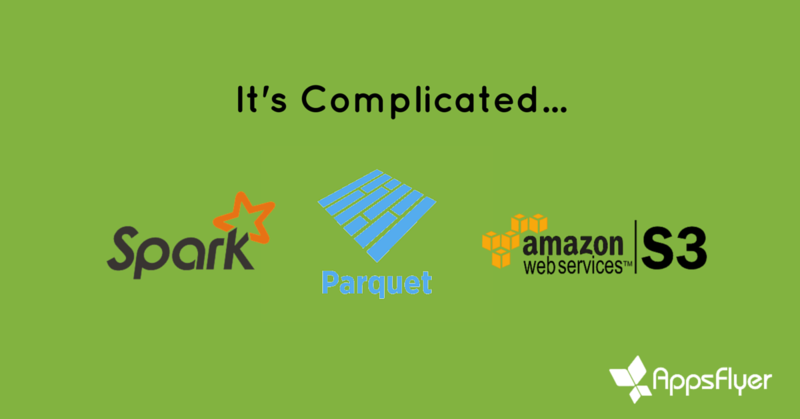 Parquet and Spark seem to have been in a love-hate relationship for a while now. On the one hand, the Spark documentation touts Parquet as one of the best formats for analytics of big data (it is) and on the other hand the support for Parquet in Spark is incomplete and annoying to use. Things are surely moving in the right direction but there are still a few quirks and pitfalls to watch out for. Even when you are handling a format where the schema isn’t part of the data, the conversion process is quite simple as Spark lets you specify the schema programmatically. The Spark documentation is pretty straightforward and contains examples in Scala, Java and Python. Furthermore, it isn’t too complicated to define schemas in other languages. For instance, here (AppsFlyer), we use Clojure as our main development language so we developed a couple of helper functions to do just that. The sample code below provides the details: The first thing is to extract the data from whatever structure we have and specify the schema we like. The code below takes an event-record and extracts various data points from it into a vector of the form [:column_name value optional_data_type]. The data type is optional since it is assumed to be a string unless otherwise specified. Amazon S3 (Simple Storage Services) is an object storage solution that is relatively cheap to use. It does have a few disadvantages vs. a “real” file system; the major one is eventual consistency i.e. changes made by one process are not immediately visible to other applications. (If you are using Amazon’s EMR you can use EMRFS “consistent view” to overcome this.) However, if you understand this limitation, S3 is still a viable input and output source, at least for batch jobs. When we used Spark 1.3 we encountered many problems when we tried to use S3, so we started out using s3n – which worked for the most part, i.e. we got jobs running and completing but a lot of them failed with various read timeout and host unknown exceptions. Looking at the tasks within the jobs the picture was even grimmer with high percentages of failures that pushed us to increase timeouts and retries to ridiculous levels. When we moved to Spark 1.4.1, we took another stab at trying s3a. This time around we got it to work. The first thing we had to do was to set both spark.executor.extraClassPath and spark.executor.extraDriverPath to point at the aws-java-sdk and the hadoop-aws jars since apparently both are missing from the “Spark with Hadoop 2.6” build. Naturally we used the 2.6 version of these files but then we were hit by this little problem. Hadoop 2.6 AWS implementation has a bug which causes it to split S3 files in unexpected ways (e.g. a 400 files jobs ran with 18 million tasks) luckily replacing Hadoop AWS jar to version 2.7.0 for Spark solved this problem and using s3a prefixes works without hitches (and provides better performance than s3n). Note that this doesn’t work in Spark 1.3. In Spark 1.4 it works as expected and in Spark 1.4.1 it causes Spark only to look at _common_metadata file which is not the end of the world since it is a small file and there’s only one of these per directory. However, this brings us to another aspect of the “Parquet Tax” – the “end of job” delays. To sum up, Parquet and especially Spark are works in progress – making cutting edge technologies work for you can be a challenge and require a lot of digging. The documentation is far from perfect at times but luckily all the relevant technologies are open source (even the Amazon SDK), so you can always dive into the bug reports, code etc. to understand how things actually work and find the solutions you need. Also, from time to time you can find articles and blog posts that explain how to overcome the common issues in technologies you are using. I hope this post clears off some of the complications of integrating Spark, Parquet and S3, which are, at the end of the day, all great technologies with a lot of potential. Morri Feldman and Michael Spector contributed to this post. Arnon Rotem-Gal-Oz is the Chief Data Officer of Appsflyer. Arnon has more than 20 years of experience developing, managing and architecting large distributed systems using varied platforms and technologies. Arnon is the author of SOA Patterns from Manning publications.